Valentino Rossi has sealed a new two-year extension to his Yamaha contract that will keep him racing until at least 2020 by taking an impressive podium finish at the opening race of the 2018 season. Not quite able to deliver a challenge for the victory against rivals Andrea Dovizioso and Marc Marquez despite looking ultra-competitive all race long, the Movistar Yamaha racer was nonetheless able to come away from the race happy with his performance. 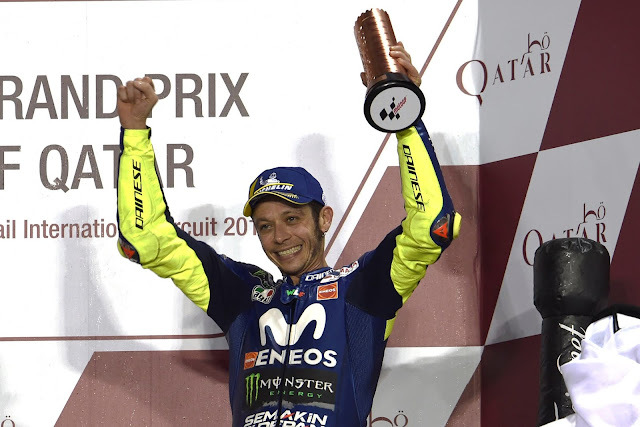 Even more, than setting him up for an attempt at title number ten, though, the podium also helped Rossi draw a line under doubts about his performance. Set to remain in the premier class until he is at least 41 years old, the Italian’s strong start to the season is a warning to his critics not to underestimate him just yet. And while it might also help him to put his own feelings at rest, Rossi is also aware of the risks that his new contract brings to him. Keenly conscious of the potential to harm his own legacy by outstaying his welcome in MotoGP and fading into the mid-pack rather than going out at the top, Rossi told MCN that the benefits of extending his deal outweigh the risks.